Dr. Marigold Linton has been awarded the Jean E. Simmons Honorary Membership Award for Excellence in Science Education, a GWIS Honorary Membership Award. She is an enrolled member of the Morongo Band of Mission Indians, and was born and raised on the Morongo Reservation in Southern California. Dr. Linton is the first California reservation Indian to have ever left a (California) reservation to go to a university. 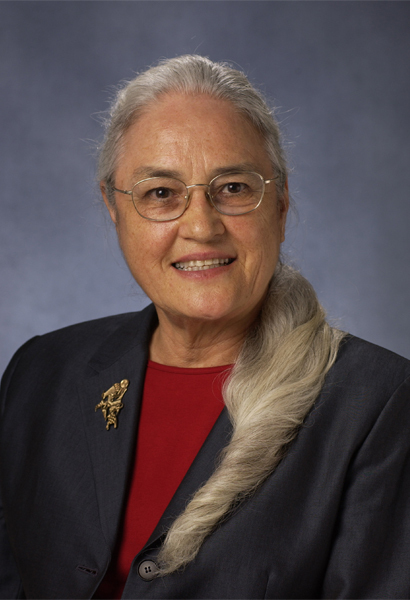 She is reportedly the 17th American Indian to have ever earned a PhD in any discipline. 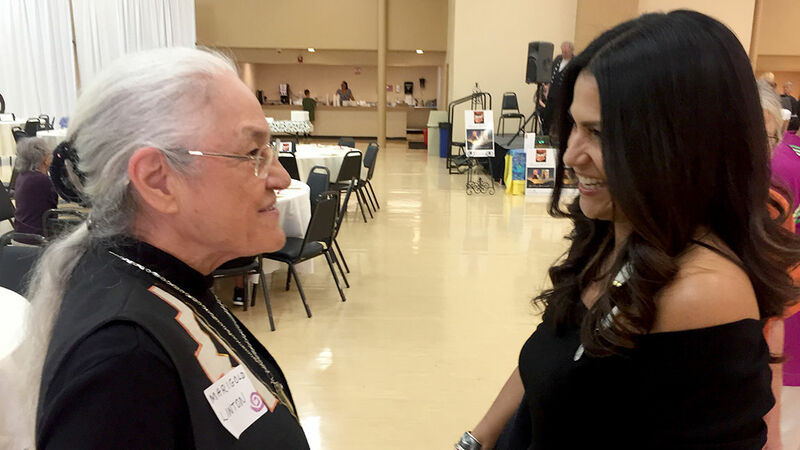 She is counted as a founder of both the Society for the Advancement of Chicanos and Native Americans in Science (SACNAS) and the National Indian Education Association (NIEA) and now serves on COSA, SACNAS’ Committee of Senior Advisors. What was your inspiration to become a cognitive psychologist? Specifically, what led you to choose long-term memory as your field of study? I left the Morongo Reservation just four years before I graduated from college. The concept of choosing a field of study was totally alien to me, but I had done animal studies (hunger drive and motivation) as an undergraduate, and continued to do these studies in graduate school at the University of Iowa. Did I have a passion for this? No, but I liked the publications. Then I transferred to UCLA where I began my own studies on word association and associative memory. My dissertation was on the galvanic skin response (GSR), a Russian technique. In todays’ terms, I might have been considered a neuropsychologist. Once again, this was something for which I had little passion but had received a research fellowship. For an impoverished young Indian woman, that fellowship paid for about five years of graduate work. (I am perhaps the 17th American Indian (AI) PhD, but interestingly, the second AI woman psychologist.) After a brief pause working at an adolescent suicide project in down town LA to support myself until I completed my PhD, I arrived at San Diego State College as a temporary hire – what might now be called an adjunct professor. In due time, I was provided a small lab. It was clear that I couldn’t work on the GSR because the equipment was very expensive—the concept of my obtaining a federal grant never occurred to me. So I continued doing small but easily published research on word association and the like. I became a full professor at SDSC when I was 35. This was easier to do then than it is now. That day, as soon I had financial security and knew I wasn’t going to starve to death and wouldn’t have to go back to the reservation in disgrace, I started working on my long-term memory research. This was work I found novel, provocative, and challenging. This work was sufficiently unique and interesting that I acquired considerable international standing. The research I began then has continued with variations to this day. Working on this research for more than 45 years is probably less like passion and more like a very long and deeply satisfying marriage. As the first woman who left a California reservation to attend college, you must have overcome lots of hardship. What was the biggest obstacle and how did you overcome it? During the first year or two off the reservation, there were virtually no days that I didn’t confront some difficulty, large or small. I had virtually no money, and my family was needier than I was. I just didn’t fit into the “white man’s world.” I tried very hard to be like everyone else, and to the extent that I could and still spend all my time studying, I did. There were two big challenges I faced in SDSC’s psychology department. The first was that all of the men hired in those years were hired as assistant professors. All the women were hired more casually. I protested to a professor who had a tenured wife in another department explaining that my record was better than that of any of the recently hired men. They said, fine, they’d put me on tenure track. As is the old Indian tradition, I demanded that they put all the other women on tenure track as well. Remarkably, they did. The second challenge occurred because now, as an assistant professor I had to lecture to classes of between 30 and 60 students. I had never spoken a word to a group larger than five except when I read brief papers at conferences. Indians don’t do a lot of talking; when a message is delivered, it is brief and clear. This background provides very poor preparation for the 50-minute class. My AI name is “She Walks with Purpose,” so I attacked the problem as best I could. I wrote out every word I had to say. Before class each day, I went to the bathroom and, overcome with the stress, threw up. Then I went to the class and read my lecture. Interestingly, if I was asked questions, as I often was, I had no difficulty answering them clearly and at length. My students said that my answers were much more interesting than my carefully read lectures. By the second semester, I was able to give my lectures with just notes. Did you find that anything from your experience on the reservation benefited your career later on? People often comment on how unusual my research is and ask how I can stand to do something that takes so much time over such a long period. I think that even semi-traditional Indians have a completely different sense of time. I continue to do my experiment that tests my own long-term memory every day and, even on the best or easiest day, it takes about an hour (distributed throughout the day). Some years ago as we were walking, I said to my husband, a mathematician, “I’ve been doing this experiment for 40 years and have spent an hour a day every day during that time. How long is that?” His reply was “Too long!” This may be one difference between a white man and an Indian. I think the Indian attitude that the tribe is in it together has also had a positive effect on my career. I have always tried to help others who I see as my compatriots to come with me. Previously, I described getting all of the women in psychology at SDSC put on tenure track. I have failed to get family and cousins educated, but recently a grandnephew has indicated a strong interest in becoming a psychologist. I provide him endless advice and will provide him significant support as he needs it. You provided significant contribution to the scientific community through your career as a tireless advocate for American Indians (and other minorities) in the sciences. Can you talk about the motivations that drive you—especially when there were challenges? What is the achievement you are most proud of? My general motivation—I believe that I have been remarkably fortunate in my career and my life. There are so many times along the way that I might have faltered, failed, or even worse. When I look around myself and see many talented individuals who, for whatever reason, have either not had chances or have not seized them, I often think that just a little push, or just a little help, at the right time might make all the difference. One of my most interesting challenges was setting up the collaboration between the University of Kansas and Haskell Indian Nations University. My task provided by the provost was to “do good for Indians.” If I were to “do good” as instructed, I decided I should get some grant money from NIH to support the collaboration. Those funds would go on to do a lot of good for many, many American Indian students (only qualifying AIs attend Haskell). One obstacle I had to overcome was the fact that I had never written a proposal, but I had read many in earlier decades. When I indicated an interest in grant writing, the folks at NIH invited me to review the current proposals for their Bridges program. I learned more about reading and writing proposals during that three-day period than I had in the prior decade. I was highly motivated because I really wanted to do well in my new venture, and I really wanted to help Haskell. I knew I needed partners and found several folks who have continued to collaborate with me for about twenty years. One thing I was not motivated toward was that I did not want to be the principal investigator (PI). I knew I was a lousy manager and didn’t want to risk the success of the grant in the hope that I might miraculously become highly skilled. My collaborator was a wonderful manager. As I am likeable and the folks at NIH grant community knew me, I put myself on as Co-PI. We were funded, so the collaboration between Haskell and KU began. The institutions had been close neighbors for more than 100 years but had never worked together. For the last twenty years, the challenge has been to maintain and expand the collaboration. Through a variety of mechanisms, I have assisted in securing over 30 million dollars to support the collaboration and ensure that the relationship between the institutions remains close. How do you balance different roles, especially your professional research, outreach, and advocacy responsibilities? The balances between professional research and outreach and advocacy responsibilities are always difficult. It helped that I was a full professor at two institutions before I was 40. As I indicated earlier, the day that I received professorial rank, I began work on what is regarded as a very significant study: what is now a 40-year study of recall using my own memory. More than 100 years ago, Ebbinghaus studied his own memory for six years and that was regarded as a very long period. My study is very much more complex in terms of design and materials and much more long lasting. However, I emphasize that I had just become full professor because that meant that number of publications no longer impacted rank or salary. Thirty years ago, both my husband and I moved into administrative roles. Administrators don’t spend every night grading endless papers, so life became considerably easier. Over a 40-year period, I have been able to manage both doing “my experiment” (at least an hour every day) and advocacy activities (some of this requires ongoing grant writing activities, e.g., the last couple of months). It is now becoming more urgent that I devote time to writing up and publishing an updated summary of results so far. My plan includes hiring a graduate student with interest in memory who will assist me in the analyses. What do you find is the most challenging about being a female scientist? What are your suggestions to young female researchers today? Although I have described difficulties I had dealing with peoples’ treatment of me as an Indian, I think I have had relatively few challenges as a woman. No tenure for women in psychology at San Diego State—I reasoned with them once and the situation changed. Now to be sure, I missed chances to become both chair and dean at the University of Utah, each time to a white male, but I was never sure I would have been very effective in either role. Then there is the harassment issue: The only serious direct moves on me were made by a full professor who made moves on all the young women in the department. They hated to get on the elevator (twelve floors) with him because of his behavior. Only once, he made a grab for my breasts, I made a grab back somewhat lower. He didn’t say anything, I didn’t say anything, but he NEVER made a move on me again. When I told the other women how effective this had been, they replied, “Well YOU could do that.” It was apparently not a one-size fits all solution. In just the past year the #METOO movement suggests great promise for a solution that fits many more people. After I got out of graduate school I never again worked with a male research collaborator. Doing completely independent research has eliminated most research challenges. I’m slow but that is my own peculiarity, and no one is going to steal my research. Recently, a well-known memory researcher asked me to do some analyses of my data to answer a research question of his. (This would have been a lot of hard work, and it is not a question in which I had any special interest.) I invited his research assistant to come to Phoenix and perform the analysis on my data here. They decided to answer the question in alternative ways, my desired outcome. What would I tell young female researchers? One must find appropriate mentors. One must be strong. One must be confident. One must move forward. One has to choose research and other partners carefully. Don’t wait to middle age to write your first proposal (mentors can help you here). Having close colleagues of both genders—more difficult when you are young than when you are older—is very important. Expect to change career trajectories a couple of times during your life. Give great thought to these choices. Do what you love. Work to recognize opportunities that come along. It is easy to miss even those that are right before your eyes. What do you see about the scientific culture that has changed with respect to gender equality, and what still needs to be fixed? Women in the past decades are more likely to be in the “hard” sciences than earlier. They are frequently PI’s on large grants. They run their own labs and train graduate students. Women appear more frequently as chairs of departments, deans of colleges, provosts, vice presidents, and presidents. (I created the Leadership Institute because, at the time I could count the number of AI and Hispanics who held positions of deans or above on one hand. This is no longer true in only a decade.) Periodically, women become Nobel laureates. Such improvements occur in industry as well as in the academic world. Women are increasingly working with other women. I’m happy to say that both of my (step)-daughters have become scientists, and they have been very effective in their careers. Times have changed so I can’t claim a lot of credit, but I don’t think it hurts to have a gender appropriate role model in the family. Unfortunately, there continue to be pockets of “sloth” where things are not moving forward—where males continue to dominate the departments and colleges. The numbers of women in mathematics, computer sciences, physics, etc. must continue to increase. Not surprisingly, I don’t think this is a simple matter of chromosomes. I think women often are ignored when they speak (in meetings, etc.). I suspect that research performed by women is still less cited or appreciated than comparable research by men. I think ones’ particular style may help gain acceptance but society also has to change. What do you want to tell your twenty-year-old self? Get a good life partner. This must be someone you respect and love and who appreciates you for what you are. All others must be rejected. Think about your legacy. At twenty, think seriously about what you want to be remembered for at the end of your life. Two life-time awards that I cherish are the PAESMEM (Presidential Award for Excellence in Science Mathematics and Engineering Mentoring) and the 2017 Remarkable Women of the University of California. These represent the meaning of my lifelong efforts well. 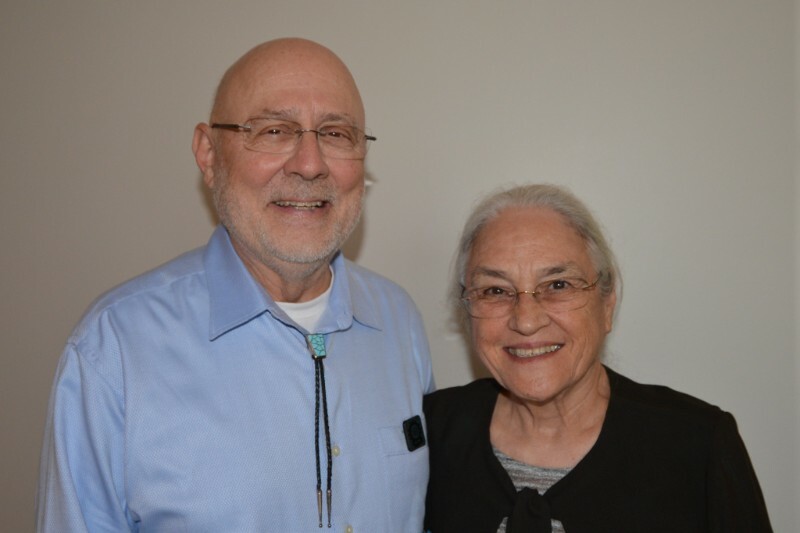 Dr. Linton with her husband, Robert E. Barnhill, SACNAS vice president for science policy and strategic initiatives. Interview performed by Shu Li. Copy edited by Rozzy Finn. Copyright © 2018 Graduate Women in Science, All rights reserved.